A good friend of mine loaned me Michael Fullan's latest book and I was so impressed I was loath to give it back. In the meantime I wrote a summary of the book for myself and thought it might make interesting reading for all who subscribe - however there is nothing like the real book! There is no doubt that a new environment is replacing the technocratic accountability, competitive top down, market forces model. The new millennium will bring dramatic changes in all areas of life whether we are ready or not. Schools are at the edge of great democratic possibilities if educators are to play a major part in the reinvention of a fairer more inclusive society. If so it will be a time for true inspirational leadership not compliance management. In 1982 Michael Fullan wrote his revolutionary book on school reform. He has now revised and expanded on his ideas in his 'The New Meaning of Educational Reform'. For school leaders, who want an insight into future possibilities, the book paints a powerful picture and offers those with the courage a real creative challenge. The following is a personal summary of some of Fullan's main ideas. Essentially it is a book about the need for schools to develop shared meaning. The basic premise is that all learning, both organisational and individual, is a continual process of 'making meaning'. This generative model of understanding is in line with the new pedagogy of constructivism which underpins modern approaches to learning. The key to successful change is the improvement in relationships between all involved and not simply the imposition of top down reform. The new emphasis is educational change is based on creating the conditions to develop the 'capacity' of both organisations and individuals to learn. The focus moves away from an emphasis on structural change towards changing the culture of classrooms and schools, an emphasis on relationships and values. The principal is the key player to develop this 'capacity' in each school. The challenge is how to share and sustain ideas about change so as to transform what is essentially an conservative system Teachers and schools need to be seen as 'moral change agents' making democratic communities possible - this is the vision that Fullan believes is 'worth fighting for'. Key words for future change will be: meaning, coherence, connectedness, synergy, alignment and capacity for continual improvement. This is in contrast to the previous emphasis on a simplistic linear model of change. School's world-wide, following a decade of top down reform are now suffering from overload. Any success, Fullan believes, that is happening, is happening in 'spite of the system'. It is now appreciated that all change involves anxiety and struggle and cannot be assimilated unless meaning is shared by all involved. At best this cultural change is a three to five year process. Predictable 'rational' imposed solutions have backfired because they ignored the culture of each individual school. As each school is unique one schools success cannot be simply transferred from one school to another. The main agents (or blockers) of change are principals. Innovative principals can develop 'moving' or 'learning enriched' schools - or what Fullan also calls 'interactive communities of practice'. In any change situation 25% is knowing what to do and 75% is the more difficult area of developing effective processes and conditions as there are many forces maintaining the status quo. Leadership for change requires a 'bias for action, a sense of urgency' and a mix of 'pressure and support'. Fullan believes that most people do not develop new understanding until they are involved in the process. Ownership, in the sense of clarity and commitment, is a progressive process achieved individual by individual until a 'critical mass' is achieved. This developmental process applies as much to an individual or a class as to a school. Educational change Fullan says is very much the 'science of muddling through' a process of trying things out and keeping what is best. These idea Fullan writes are in line with the findings of complexity or chaos theory and indicate that success depend on coping with unpredictability, conflict and inconsistency. In such an environment organisations need both security and a desire to grow. Change is an uncertain balance between stability and excitement - a self-organising process making sense of things as ones goes along - leaders need to develop the schools and individual teacher's capacity to do this together. To be successful all involved need to feel a common stake in the future. Changing schools, Fullan states, is a complex business, as no one knows for sure what is best. Teachers - it depends on what each of them do and think! Educational change depends on what teachers do and think - it is as simple and complex as that. The conditions for teaching appear to have deteriorated - stress and alienation and the intensification of teacher's work, is at an all time high. Teachers look first to other teachers in such times for sources of help and their greatest rewards come from, those moments when they feel their students have learnt something, and from respect from their fellow teachers. Too often teachers work in isolation increasingly feeling frustrated and burnt-out with imposed curriculum and accountability demands. Change is needed to develop schools as Learning Communities. Collegiality provides the best starting point in the process of teacher regeneration. 'Moving' or 'learning enriched' schools are what Fullan calls 'professional learning communities'. Teaching needs to be seen as a collective rather than an individual enterprise. This is the reason why it means it is easier to teach in some schools than others. Successful schools enforce, through moral obligations, consistent standards and they are more likely to trust and value others and ask for and share expertise. This is what makes such schools more easy to teach, and learn to teach better in, than others. Teachers in such schools are less likely to uncritically conform to imposed ideas. They have developed the capacity to self reflect, to examine student performance and act on their own understandings. Effective teachers, Fullan states. account for 30% of the variance of student progress. There are three areas of importance to be effective: teaching skills; classroom climate; and professional characteristics such as, holding high expectations, a passion for improving, holding people accountable and team work. Real pupil improvement Fullan states comes from the 'power' of having 'three good teachers in a row'. To achieve such change requires reculturing the teaching profession as Fullan believes that there are few schools that currently could be called true learning communities. Wanted a 'miracle worker' - the role of the principal. The principal is the gatekeeper of change. There is not an improving school without a leader who is good at leading transformational improvement. Successful principals share leadership, they reach out to their parents and community and work hard to expand the professional 'capacity' of the teachers to develop a coherent professional community. Such leaders are relationship centred, able to develop a clear collegial value framework and individual accountability. Such principals foster the conditions required for school growth and develop a commitment to a mutual purpose and a shared belief in ongoing common actions. By doing this they develop school capacity which in turn affects the quality of the teaching within the school. Such individual and school-wide capacity development combats the fragmentation and curricula incoherence presented by multiple innovations. Only a minority of current leaders, Fullan believes, achieve this. Leadership is a complex art and what is at stake is the reculturing of a school. Effective leaders are energy creators, creating harmony, forging consensus, setting high standards, and developing a 'try this' future orientation. They are forever hopeful. With excellent leaders students are more likely to achieve the power of 'three good teachers in a row'. The students the missing participants in school change. Student views often get lost in the shuffle of school change. They are rarely thought of as participants in the process. Fullan asks, what would happen if we valued their opinions? Students to be successful need to be provided with relevant, engaging and worthwhile experiences. Disengaged students lack meaningful connections with teachers. Few students report that teachers ask them for their opinions, many find lessons boring, and a great majority of student comments reflect an alienation theme. Student learning is enhanced when they understand what is expected of them, when they get recognition for their work, learn quickly from their errors, and receive guidance in improving their performance. Too many students, particularly at the secondary level, are disengaged from their learning - and a growing number feel alienated. Some thing needs to be done. More of the same will not work. Professional communities work hard on the problem of relevance. Teachers work hard on expanding and refining their teaching repertoire. And students notice. Effective teachers give students a 'voice' in their classrooms. Such teachers invite students to talk about what makes learning difficult, what diminishes their motivation, makes then give up, or settle for a minimum effort position. They expose students to an 'atmosphere of hope'. Students have ideas about how schools should be. Students in recognition for a safe and caring environment where their efforts are rewarded, will work hard. Children, Fullan believes, are vastly under-utilised resources. Not only must they be part of the solution, but also, in many cases, they may even have better ideas for solutions. Regional Support for schools - a new role to play? Where school have been left to the vagaries of self-management it is over to each school to ensure its own development. If a district presence is part of the system they can play an important role in school transformation. Success however requires the difficult art of balancing top down and bottom up change. Districts that are a powerful force for change can share and develop the ideas of 'moving 'schools but to be successful plans for successful implementation must be left up to local schools. Chicago, in the late 80s, like New Zealand, decentralised all it's schools. What eventuated was called the 'rule of three thirds!' One-third engaged in self-initiated re-construction, one-third struggled/complied, one third were left behind. Since 1992 Chicago has re-organised districts as key players to becomes advocates for local schools, focussing on capacity building and intervening in failing situations. Successful districts need to maintain a strong interest in spawning and diffusing innovative local school developments. Fullan draws attention to the similarity between an effective school, an effective leader, an effective teacher and an effective district. Leadership based on relationships and trust is needed at all levels to encourage schools to pursue autonomy in the midst of a potentially dependency situation; achieving this autonomy is an entrepreneurial act. The most critical role of any cental office is to support learning especially amongst principals, who will in turn do the same for teachers, who in turn will empower their students. To achieve this ideal regional support systems will requires their own cultural transformations. Educational Consultants - do we need them? Consultancy is also about developing the school's capacity, motivation and commitment to engage in improvements. It hardly ever happens that way. In particular, there are no easy answers for 'struggling' schools. Innovations are more successful if they have effective leadership, with an instructional focus, combined with strategies to obtain support at the school and in the wider community. Too little emphasis has been given to creating the conditions to create engagement and emotional commitment to take action when translating 'answers' seen in effective schools. It is often to easy to accept a false consensus and to ignore silent 'voices'. Such developments are sure to fail. The parents and the community - whose schools are they anyway! Fullan reminds us that if schools have trouble comprehending change imagine what it is like for the parents - particularly those whose memories of their own schooling is less than positive? Involving parents is important because the closer parents are to the educator the greater the educational impact. This is another case of Fullan's 'power of three'; teachers, parents and students aligned make all the difference. Schools need to reach out to parents but to do this will require shifts of power and influence. Parents, and the wider community, have largely untapped expertise essential to the partnership. However well, or badly parents do, they are the students first educators. Schools need to develop an 'invitational' attitude towards parents and do more to help parents assist their children. 'Moving' schools involve parents in a range of innovatory ways. Most parents do not want to run the school but they do want their children to do better. There is little evidence to indicate over the years that schools and parents have become closer. Parent involvement cannot be left to individual teachers it must involve a school wide emphasis. Parent involvement must be seen as a crucial and alterable variable. This 'power of three' too often remains an unleashed force. School Boards and teachers need to take the first steps. Involving the wider community is future challenge. Too many schools still operate in isolation from their community. Schools belong to the community they reside in and 'moving' schools acknowledge this. New community/regional organisations may well be required in integrate schools into the wider community? Governments role - historically few governments have got it right! Lasting school improvement cannot occur if the system is not helping. All people, at all levels, need to work on building learning organisations. Historically most governments have got it wrong. If governments rely only on accountability measures, and pressure and support to change schools, but neglect capability building, deep and lasting changes will not be achieved. Structural changes, curriculum and accountability measures, popular world-wide in the 90s, create overload and have done little to change the quality of teaching and learning. Accountability schemes can never work because they cannot create the beliefs and behaviours necessary for success. Too often curriculum innovations have side effects worse than the cure. It takes a courageous principal to act flexibly in such situations. Leaders with ' capacity' are less likely to 'toe the line' and will adapt innovation to suit their own purposes. For many principals is easier to comply with imposed demands and in the process 'get better at a bad game'. For central governments it is too easy to err in providing either too much or too little control. What is necessary, Fullan believes, is to start with top down change, and then to add 'capacity building' in phase two. This is in line with leadership both at the school and classroom level. Develop standards, set expectations and then move into developing an environment (or culture) that develops schools as professional learning communities. The professional development of teachers to attract teachers into teaching. There is an urgent need to attract good people into teaching. Exciting transformed schools, fired by moral purpose, is one attraction. Improving teacher education is another. Once in schools new teachers need to be provided with expert mentors and support programmes. Re-culturing schools as exciting learning communities is the only way to attract talented people. There is a need is to focus on supporting school leadership to re-culture the teaching profession. To be effective schools need to develop agreed standards of practice that are evident in the daily organisation and culture of the school. This demands that teachers work together, modelling commitment and sharing ideas so that quality learning and teaching can be cultivated. Everything converges on school leadership that can articulate and implement an agreed vision of learning, and to ensure that it is shared by schools community. Leaders need to advocate, nurture and sustain a school culture, and an instructional programme, conducive to student learning and staff growth. Such leaders promote the success of all students by promoting a safe and effective learning environment. It may be a simplification, Fullan says, that the difference between success and failure of any school is the quality of the principal, but it is not far from the truth. Unfortunately for many principals their careers have prepared them to manage a system that no longer exists. There is a need to attract and develop a new generation of school leaders who are able to develop learning cultures to thrive in a radically new and demanding world. Principals do need contact with exemplary programmes. They need mentors and peers to break down the privacy of their own practices that produce isolation; isolation at any level is the enemy of improvement. Even the most successful principals are still dependent on the knowledge and skills of each individual classroom teacher. The biggest revolution, Fullan believes, is re-culturing the teaching profession. The profession, he believes, is yet to come of age. This new professionalism will be collaborative not autonomous; open rather than closed; outward looking rather than insular; and authoritative but not controlling. More than anything the new professionalism will make huge demands on teachers' own learning to learn about: learning styles, multiple intelligences, how to integrate technology; how to interact with adults 'out there' and how to get more support for their teaching. The problem is that is to easy to miss how very deep the need for this collegial learning approach is to develop a new culture of teaching. Leadership will have to come from many sources. The future of educational change - two forces at play! There are, Fullan says, two major forces of change at play, both with 'evil twins'. One is the top down curriculum accountability model we are all to aware of, and the other the development of schools as professional learning communities. Top down accountably models too easily turn into 'name and shame' environments which does little to help failing schools while the learning community approach can too easily turn into unrealistic 'navel gazing'. If people cannot find meaning in any reform it cannot have an impact. Learning is about 'meaning making' and it requires a radically new way of approaching learning - one that guides the individual mind through the process of many minds working together. Existing strategies will not get us to where we want to go. We cannot simply imitate principals of successful 'moving ' schools we must change the existing conditions in each school so that it is normal and possible for all people to move forward. Although short-term gains can be achieved by standards based reform it is deadly if the conclusion is that schools should do more of the same. The learning community model will fail if teachers and principals do not have the capacity to act effectively. With numbers of schools struggling, there is a need to fast track phase one of change by pushing hard on standards , providing quality support material and examples of successful practice, and providing focussed professional development. As results begin it is then necessary to shift to 'capacity building', to encourage local ownership. This cannot be a simple linear process and phase one can be seen as pre- capacity building. The flow is from tighter to looser forms of control, from external to internal commitment, from control to guidance. A process that applies process at all levels. The 'learning organisation/community' is more than a cliché. This phrase is one of the most superficially understood terms in the change business. Learning organisations are required because improvement is a function of learning to do the right thing in the setting where you work. Ultimately no amount of outside motivation can specify the best solutions for a particular situation. It is about 'organisational knowledge creation'. People must work together to figure out what is needed to achieve what is worthwhile. You cannot get internal commitment and ingenuity from outside - expertise lies within. The only problems worth solving are the ones that exist in each and every organisation. Change is forever. Problems don't stay solved, so you have to learn to do the right thing over and over again. All together these make up the 'learning organisation'. Professional learning communities constantly worry about what is worthwhile and how to get there. They continually convert tacit knowledge into explicit shared ideas; they are 'energy and knowledge creators'. We need to consider the collective good. The 'market forces' model that underpinned the educational changes of the 90s may have been efficient, generating competition and choice but it misses two fundamental matters. Firstly school systems and democracy are closely connected. Education has a strong moral component - education should enable people to work together to achieve higher purposes that serve both the individual and the collective good. Secondly we can only move forward by learning from each other's successes and failures. Schools have to share their ideas for the benefit of the students of all schools. if teachers identify with only their own classrooms - they must be concerned with the success of other teachers of the school. if principals identify only with their own schools - they must be concerned with the success of all other schools. if school districts identify only with their own areas only. And so on. As well, now more than ever, we must identify with and help improve the surrounding community the school resides in. Everything is interconnected. All must all work together. This will be a new challenge both for schools and the wider community. We have to learn to live with change. This means we have to take change both less and more seriously at the same time. Less, because most change is superficial and more because it is important to work through change until we get shared meaning and improvement. The best defence against the relentless pace of change, Fullan believes, is to build professional learning communities that are good at sorting out the worthwhile from the non worthwhile and to look for support and healing when ill conceived or random changes takes its toll. Fullan's book is well worth a full read. It contains a hopeful message of the power of the reciprocity of personal and shared meaning - how they both contribute and enrich each other. The ultimate goal is where people see themselves as shareholders in a community with a stake in the success of the system as a whole and with the pursuit of shared meaning the key. 1 What exactly these standards are is problematic. Government do need to provide 'guidelines' to ensure equity and quality assurance but in the past implementing imposed frameworks have in themselves become part of the problem. Before I get into the review for this book, need to explain how I found out about the concept in the first place. I'm a frequent visitor to the website giveawayoftheday.com, on this site each day they offer different software downloads free. These are full versions of the software and you get to keep forever. The makers of the software get reviews of the software and word of mouth advertising. One of the downloads offered was a program by the company Concept Draw. The program was Concept Draw Mind Map. At first glance it looked like a flow chart layout program, like (I thought) Microsoft's Visio. But the layout and tools were more "organic" in nature and the software was intended to be used as a computer assistant for Mind Mapping. The software sat on my computer for a while and finally I decided to see what this Mind Mapping was all about. 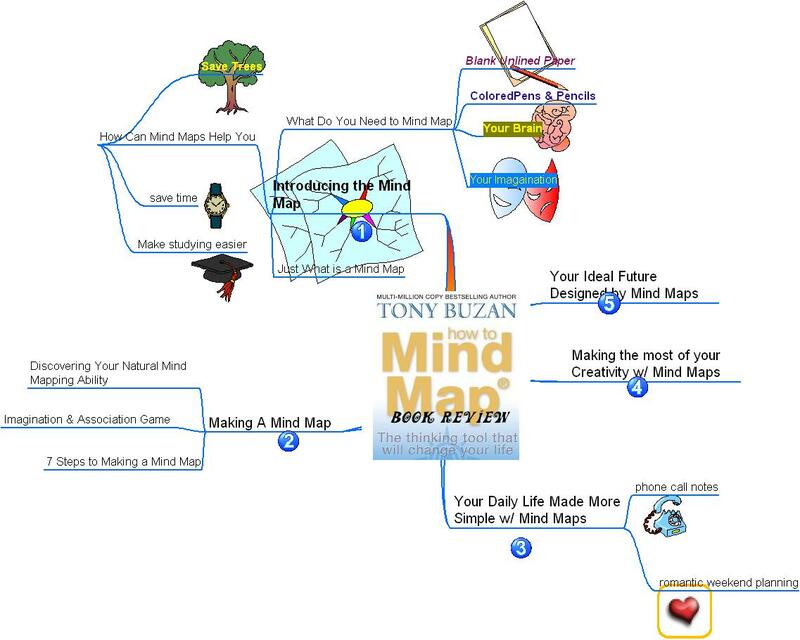 Tony Buzan has created or rather put to use the system that allows you to make the most of your brain and mind and to oranize, create and plan how the brain wants to do these things. Basically with pictures and colors and flow chart type of layouts that evolve from a central Idea or spoke. The sub-points then branch off in curvy colorful lines with pictures drawn to assist memory and learning. 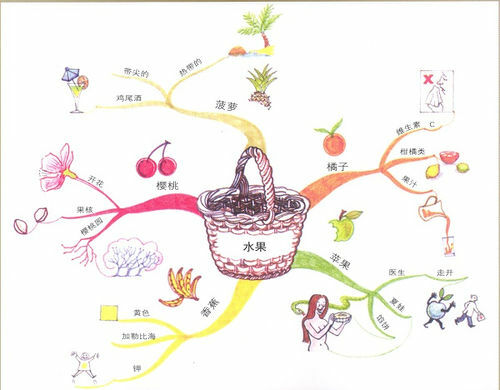 The first mind map you creat in the book is based on fruit. This is used to prove a point that the brain doesn't think in words or in straight lines but rather in abstracts and colors. In other words, in the book you are told to think of the word fruit and then close your eyes. What your mind's eye then sees is not the letters F-R-U-I-T, but maybe a basket of fruit, bananas, apples, oranges, you know actual pictures. From there you draw a mind map that branches out into several ideas for fruit in a way that your brain can read and interpret. Now, take this concept further and with mind mapping you are able to make notes and lists and keep them in a way that your brain can interpret. Imagine, and yes it is possible, to have a lecture or presentation drawn out on one sheet of paper rather than on a stack of 3x5 cards. That is just one of the many uses of mind mapping. Maybe you are a student and with your notes you have to sift through pages of lined out notes. With Mind Mapping you can find your central concepts easy enough and make studying easier. If you are interested in making your life easier and learn how to better create, organize and plan check out this cool book...I'm still learning how to do this right, but it is a fun process. The general benefits of Web-based training when compared to traditional instructor-led training include all those shared by other types of technology-based training. These benefits are that the training is usually self-paced, highly interactive, results in increased retention rates, and has reduced costs associated with student travel to an instructor-led workshop. Access is available anytime, anywhere, around the globe. Students always have access to a potentially huge library of training and information whether they are working from home, in the office, or from a hotel room. As cellular modems become more popular, students will even be able to access training in a place that doesn't have a traditional phone line or network connection. Per-student equipment costs are affordable. Almost any computer today equipped with a modem and free browser software can access the Internet or a private Intranet. The cost of setup is relatively low. Student tracking is made easy. Because students complete their training while they are connected to the network, it is easy to implement powerful student-tracking systems. Unlike with CD-ROMs that require students to print reports or save scores to disk, WBT enables the data to be automatically tracked on the server-computer. This information can be as simple as who has accessed the courseware and what are their assessment scores, to detailed information including how they answered individual test questions and how much time they spent in each module. Possible "learning object" architecture supports on demand, personalized learning. With CD-ROM training, students have access only to the information that can be held by one CD-ROM. The instructional design for this type of delivery, therefore, has been to create entire modules and distinct lessons. But with WBT, there is virtually no storage limitation and content can be held on one or more servers. The best WBT is designed so that content is "chunked" into discrete knowledge objects to provide greater flexibility. Students can access these objects through pre-defined learning paths, use skill assessments to generate personal study plans, or employ search engines to find exact topics. Content is easily updated. This is perhaps the single biggest benefit to WBT. In today's fast-paced business environment, training programs frequently change. With CD-ROM and other forms of training, the media must be reduplicated and distributed again to all the students. With WBT it is a simple matter of copying the updated files from a local developer's computer onto the server-computer. The next time students connect to the Web page for training, they will automatically have the latest version. There are only two real disadvantages to WBT, and both will be overcome in the next five to ten years as high bandwidth network connections become as common as telephones. The first drawback, when compared to live instruction, is the lack of human contact, which greatly impacts learning. WBT is better than CD-ROM learning in this regard. Students can use their Web connection to e-mail other students, post comments on message boards, or use chat rooms and videoconference links to communicate live. While this type of interaction is helpful, and an improvement over CD-ROM learning, it still doesn't have the impact of a live workshop. With higher speed connections and improved conferencing software, one day students around the world will be able to communicate in real time with each other through full-screen video. The second major drawback is the lack of multimedia in many WBT programs. The use of audio and video are critical to creating compelling metaphors, realistic job simulations, and accommodating different learning styles. Full multimedia delivered over corporate Intranets is possible, and many companies are doing it (see Case Studies in this book for examples). But in most cases, even if students have a high-bandwidth Intranet connection, corporate information technology departments don't want large media files used because it slows down the entire network. The result is that most WBT programs are still comprised of text and graphics alone. Once again, the bandwidth problem will be solved in the near future with advancements in network protocol standards and software compression. Using Web-based training, like all other delivery media, has advantages and disadvantages. Trainers and designer must carefully weigh these against the profiles of other options on a case-by-case basis. 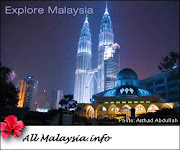 KUALA LUMPUR, – What is One Malaysia? In not too many words, it remains faithful to the two planks of the National Economic Policy (NEP) – the eradication of poverty irrespective of race and economic restructuring that was launched by Najib's father Tun Abdul Razak Hussein in the aftermath of the May 13 race riots. The opinion piece headlined 'Satu Malaysia versi sebenar' by Awang Selamat, a pseudonym used by the newspaper's editors, allayed fears that Najib will end the NEP and ensure equality for all. Among others, Awang wrote, it included elements of development based on unity and integration, the people's interests and excellence to push the country's progress, adding he was glad when Najib denied it had anything to do with a 'Malaysian Malaysia' although the government would be fair to all races to transform the country. "Awang hopes the true version of One Malaysia is understood clearly. The affirmative policies to help the Malays who really poor and left behind (compared to other races) will continue. "Indeed there is a need to continue the affirmative policies due to historical realities and the social contract while the government intensifies efforts to increase the quality of life for all," he wrote. While Mingguan Malaysia, which enjoys wide circulation in Malaysia's rural areas where Umno still commands majority support and respect, has made its definition, it remains to be seen how Najib will put the slogan into action. However, it is clear that the concept will not work with a top-down approach as Malaysians become more aware of the power of their vote and are willing to shop around for a political party or coalition more in tune with their desires and needs. While the economy is at the forefront of their minds, Malaysians – particularly the young and those in the urban areas – have been clamouring for an independent judiciary, respectable police force, equal treatment and politicians who don't speak from both sides of their mouths. They have been demanding reforms in various government policies and institutions, handing former prime minister Tun Abdullah Ahmad Badawi, a huge mandate in the 2004 elections but taking it back in 2008 when the reforms faltered. The country's sixth prime minister has added "People First, Performance Now" to his One Malaysia concept to recapture the people's confidence and it will be up to him and his cabinet, which has already been maligned by the opposition, to ensure they live up to his slogan. And ensure that his "One Malaysia" is the same as their "One Malaysia". Models of teaching are really models of learning. The most important long-term outcome of instruction may be the students's increased capabilities to learn more easily and effectively in the future, both because of the knowledge and skill they have acquired and because they have mastered learning processes. (Joyce, B., & Weil, M.) That implies that a major role in teaching is to create powerful learners. 2. Where do models of learning/teaching come from? A model of teaching is a description of a learning environment. The descriptions have many uses, ranging from planning curriculums, courses, units and lessons to designing instructional materials - books and workbooks, multimedia programs, and computer - assisted learning programs. The "descriptions" have been designed for a variety of different settings and can be adjusted to the learning styles of students and to the requirements of the subject matter. 3. What kind of model is suited to...? Apakah penjelasan kepada 4 teori ini ? Sila klik untuk penerangan selanjutnya !! other sports. This is sometimes called being Kinaesthetic smart. You may be word smart. You will enjoy reading, writing and talking about things. This is sometimes called being Linguistic smart. you are also good at solving problems. This is sometimes called being Logical smart. You may be people smart. You will like to mix with other people and you will belong to lots of clubs. You like team games and are good at sharing. This is sometimes called being Interpersonal smart. You may be myself smart. You will know about yourself and your strengths and weaknesses. You will probably keep a diary. This is sometimes called being Intrapersonal smart. or the quality of a tone. This is sometimes called being Musical smart. about them. This is sometimes called being Naturalistic smart. kebolehan mereka. Inilah dinamakan PENGAJARAN & PEMBELAJARAN BERKESAN ! I'm still looking..what is the most powerful application that can used for WEB Base Teaching & Learning?. What WEB Base application can fulfilling teachers and students dreams ?. Please all educator give me your suggestion?, give me your COMMENTS ?. Salam and hii !! Cikgu dan para pendidik dari Malaysia, Singapura, Berunai dan Indonesia ..
Mari kita sembang-sembang kalau cikgu ada maklumat, pernah menggunakan aplikasi WEB BASE untuk tujuan pengajaran dan pembelajaran di dalam kelas. 1. Apa aplikasi WEB Base yang cikgu pernah atau sedang gunakan ? 2. Apa kelebihan dan kekuatan WEB Base yang sedang anda gunakan sekarang ? 3. Bagaimana saya boleh mendapatkan perisian aplikasi yang sedang anda gunakan ? 4. Dan lain-lain perkara yang boleh kita sembang tentang WEB Base untuk tujuan Pengajaran dan Pembelajaran dalam kelas...? WINDOWS 7, what a difference?